This year the motto is “Segen bringen – Segen sein! Respekt für dich, für mich, für andere – in Bolivien und weltweit!” (bring a blessing – be a blessing! Respect for you, for me, for others – in Bolivia and worldwide) and the money raised will go to help children worldwide, in particular in the Bolivia. With the whole country taking part, it is not unusual to raise over €40 million. 12 years ago a new playground was built on the border between the residential areas “Im Rosengärtchen” and “Camp King”. Back then it was a project involving local parents, and today the playground connects the two areas. On four mornings a week, it is even used by the charity Aktion Kinderparadies e.V. to provide daycare for groups of young children. 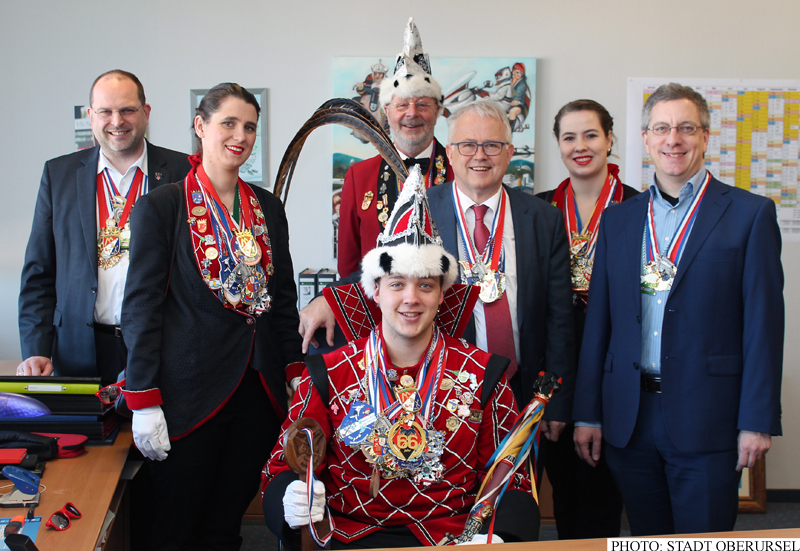 Having successfully taken over the town hall last Saturday, Prince Jürgen I. moved into the Mayor’s office on Monday where he intends to run things until Ash Wednesday. 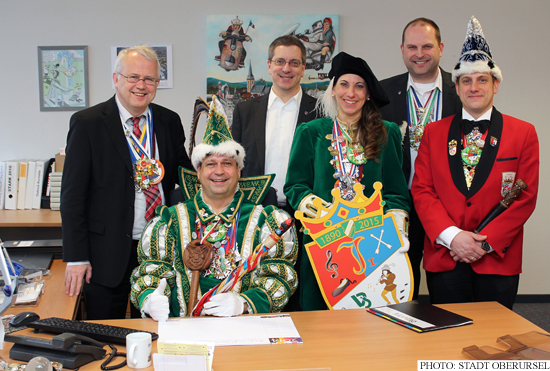 The photo shows him settling into the Mayor’s office with his page Sonja Coy and Lord Stewart Patrick Volz, with Mayor Hans-Georg Brum, Alderman Christof Fink and Treasurer Thorsten Schorr in the background. To celebrate 25 years of German Re-unification in 1990 a project has started to plant three trees in as many town as possible. In Oberursel the trees were planted at the end of October 2014 in the Rushmoor Park. Placed in an equilateral triangle 10 metres apart from each other, there is a beech tree at the western point of the triangle to symbolise the “old” Federal Republic, a pine tree at the eastern point symbolising the GDR, and an oak tree at the northern tip to symbolise the unified country. It may have been Friday 13th, but the fountain festival got off to a good start on Friday evening with fine weather and a slight breeze over the market square. As in previous years, Oberursel is taking part in the annual “Stadtradeln” campaign to get as many members of the public to leave their cars behind and use a bicycle instead. Between 2nd and 22nd June, 2014, teams in the town will be trying to ride as many kilometres as possible, at the same time trying to beat the 2013 total of 44.641km. 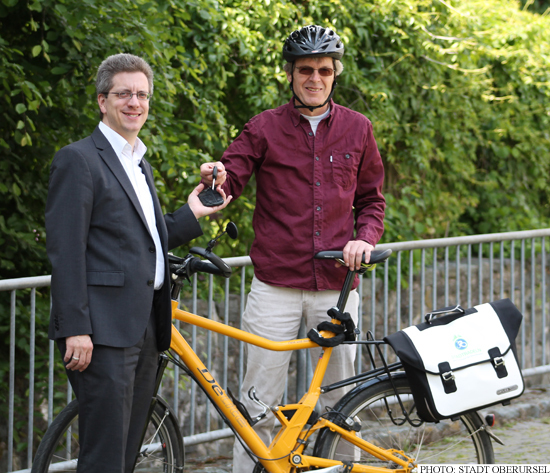 One local politician and Green Party member, Peter Matthäy, has gone a step further and handed over the keys to his car for the next three weeks, ensuring that it is his bicycle that takes him everywhere during that time. This year the motto is “Segen bringen – Segen sein!” (bring a blessing – be a blessing!) and the money raised will go to help children worldwide, in particular in Malawi. With the whole country taking part, it is not unusual to raise over €40 million.